Welcome to effortless, gorgeous living in this beautifully gut-renovated two-bedroom, one-bathroom home in Gramercy's well known Quaker Ridge co-op. Filled with smart built-ins, great lighting and fine finishes, no detail has been overlooked in creating a sunny Junior 4 home that embraces comfort and convenience. Stunning wide-plank oak floors invite you into a welcoming foyer flanked by oversized custom closets — there are four total throughout the home — while an expanse of south-facing windows beckon you ahead. 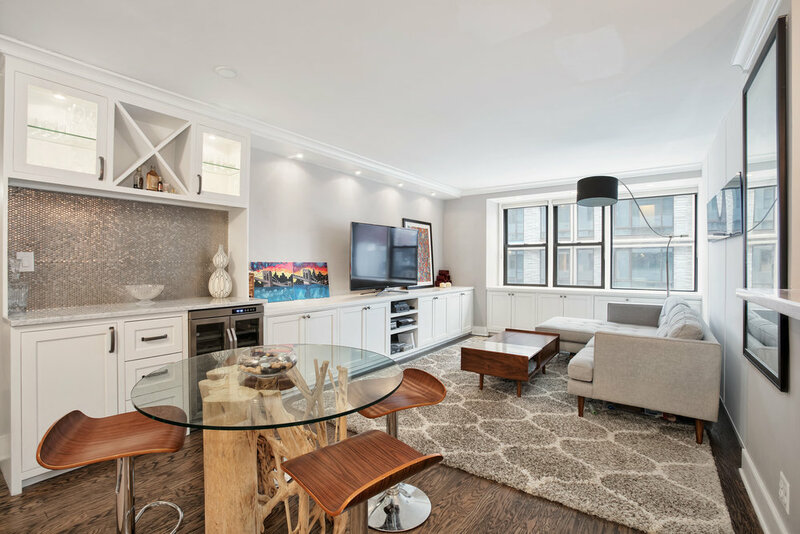 The roomy and open living room accommodates chic entertaining and relaxation with plenty of room for sitting and dining areas, a built-in bar with wine fridge, and custom cabinets for storage and A/V equipment. The adjacent open kitchen welcomes chefs with long and spacious counters and a breakfast bar, handsome cherry cabinetry and an army of stainless steel appliances, include a gas range, dishwasher and built-in microwave. Already converted to a split-two-bedroom layout, the large master bedroom includes more built-ins, two custom closets, city quiet windows and easy access to the beautifully renovated contemporary bathroom featuring floor-to-ceiling stone, a frameless glass tub/shower and modern vanity. Across the living room, the second bedroom includes a built-in desk, making it ideal as a guest room, nursery or home office. Quaker Ridge is a revered postwar co-op known for its stellar financials and low maintenance. Residents enjoy full-time doorman service and live-in superintendent, modern laundry facilities, private storage, bike storage and a residents-only parking garage with direct access to the building. Quaker Ridge allows co-purchasing and pets, but does not permit guarantors or pieds-à-terre. Set in the heart of Gramercy — with immediate access to the Flatiron District, NoMad, Union Square and the East Village — fantastic shopping, dining and nightlife are all within easy reach. Enjoy German food and world-famous Christmas decorations at Rolf's or feast on Italian favorites at historic Pete's Tavern. Union Square and Madison Square Park offer outdoor space, phenomenal greenmarkets and year-round events, and transportation is superb with 4/5/6, N/Q/R/W and L trains all nearby.